I have never been a sports playing person - I did play field hockey at school for a little while, but my first blacvk eye made me realize it wasn't for me. But I do I love watching most sports. When I lived in Canada and New York I loved going to watch baseball and especially ice-hockey. I also love to watch cricket, basketball but my favorite would have to be Australian Rules Football (AFL). For the non Aussies out there AFL is our national game of football but it is nothing like soccer. 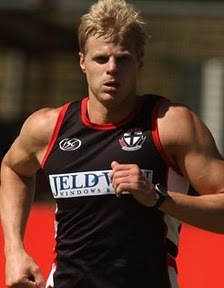 The team I support are the St. Kilda Saints and I have supported them all my life. The Saints were also my Dads team and everytime I am watching them I know he is sitting there with me. The last four weeks it has been a bit painful watching them as they have lost all four games. But today the game I watched reminded me that I do love the Saints, they played they usual winning style of game and won by 94 points and it was a joy to watch. Wow, from that second photo I can totally understand why you would love to watch the guys out playing! :-) Now he's got some serious muscle action going on there! Yes Nick is very easy on the eyes. What is it about muscles that make the ladies go "wow"?